Emir Abdelkader, the first leader of the Algerian state, was a man composed of many parts; he was not only man but religious leader, military strategist and son of a muqaddam. At times, he seemed to defy humanity itself. During a five-year captivity in France, Abdelkader never once became angry towards his captors; after all, the emir had revolutionized warfare by protecting French prisoners of war during the many skirmishes that France and Algeria embroiled themselves in. But despite the awards he won for his humanitarianism and the fact that he fought so hard for an Algerian state in a world that was determined to reject it, film director Salem Brahimi noticed a troubling fact: many in today’s Algeria do not know who the emir is. “I feel very strongly connected to this film,” said Brahimi, who was born in London to an Algerian father. On Tuesday, Sept. 25, UMass Lowell students were treated to a screening of the film which featured a question and answer session with the director. 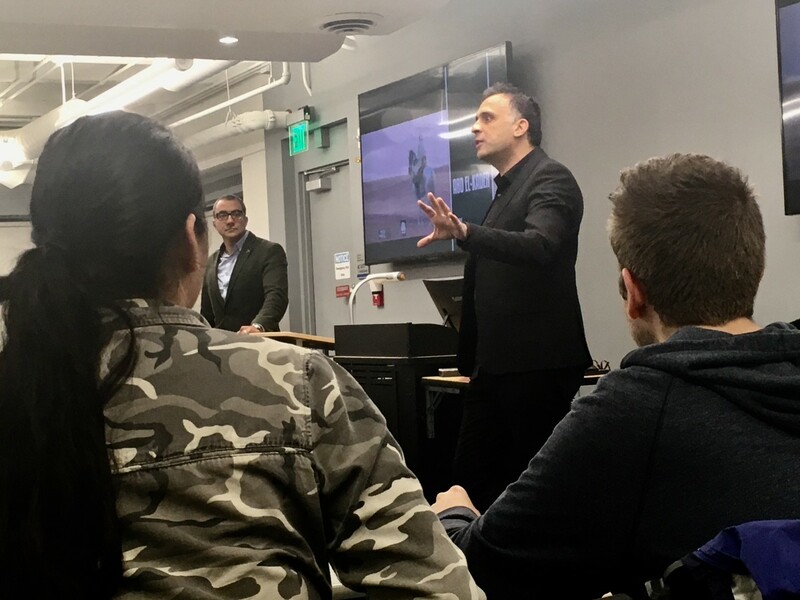 The UMass Lowell digital media department joined together with the College of Fine Arts, Humanities and Social Sciences to invite Brahimi, who was in the area to promote a film. Students in Lydon Library 110 settled down for two and a half hours for an enthralling film which covered the sprawling life of the emir. The students watched his humble beginnings as the educated son of a religious leader, the military victories which he twisted into the foundation of Algeria and his shameful exile to France. The film blends animation and strong interviews from historians, religious scholars and authors to tell the story and demystify the legacy of the man who dedicated his life to Algeria. The wealth of different perspectives offered in the film do a good enough job of depicting the emir was a real man instead of an inaccessible historical figure, which Brahimi said was his main goal in directing the film. The run time, which is a little over 90 minutes, works very hard to cover 70 years while also giving the appropriate amount of attention to not only the significance of the emir’s accomplishments but the impact that he had upon the world. While it is slow to start and certainly feels longer than 90 minutes, “Abd El-Kader” does not necessarily drag. While some tangents that the film makes can be tedious, it is important to show the audience that the emir’s legacy as a humanitarian and political icon transcended the oft-destroyed borders of Algeria. A town in Iowa proudly boasts his name and there is a scholarship which honors his leadership of Algeria. Students were allowed to further digest what they had watched through an invigorating question and answer session with Brahimi. Beyond discussing stylistic choices that he made in the film, Brahimi enlightened the audience on current relations between France and Algeria, Islam, the issues of depicting a historical figure and the cultural impact that the film has had since its release. Brahimi stressed the topics of colonialism and the effects of globalization on already-tense international relations in his address to the students and professors gathered at the event. Although the emir fought for Algeria’s right to exist nearly two hundred years ago, the issues that ran throughout his life are still prevalent in today’s society. Human conflict is not new, and the underlying causes of it have not changed over the past few millennia: colonization, the thirst for power and differences in religious belief stir the rumblings in international relations even now. Brahimi urged his audience to look for parallels to their own lives in watching the emir’s. “The point is that now more than ever… we are all in the same boat. Basically having the same problem… you’ll hear about colonialism, you’ll hear about Islam, you’ll hear about how we’ve managed that and how we actually make the different cultures colliding… we need to shake hands and sometimes collide,” said Brahimi. Despite the subject material of the film being antique and often left untaught in Algerian schools, Brahimi feels that it is significant in today’s often-tremulous political atmosphere. “If you’re not interested in the past but you’re interested in what’s gonna happen on our doorstep, on our shared doorstep… that’s the way you should look at this film,” said Brahimi.